Cerebral Palsy limits the mobility of Kevin Drennen’s left arm, but he didn’t let that stop him from taking on this fitness transformation journey, losing 103 lbs. at age 46 with The Master’s Hammer and Chisel, 21 Day Fix EXTREME, Body Beast, Shakeology, and the Beachbody Performance supplements. He entered his results into The Beachbody Challenge and won $27,000! In Dec. 2015, I had a physical. I had been on blood pressure medicine but my doctor was looking at my lab results and was concerned about me possibly being pre-diabetic. He said that I might need to get on medicine. 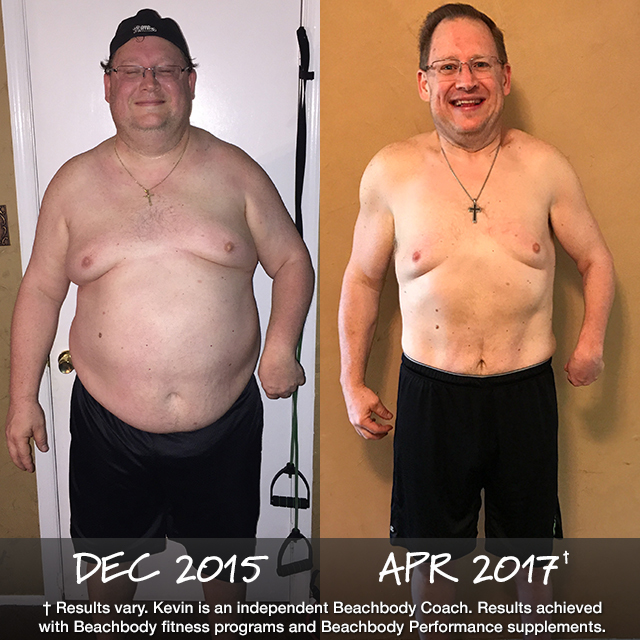 I said instead of medicine, I wanted a chance to lose weight and change eating habits to change my situation.3 I finally joined my wife in her journey of working out and eating healthier… I haven’t looked back. I thought my biggest challenge would be figuring out how to do these programs with my Cerebral Palsy, but it wasn’t. The biggest challenge was making sure my nutrition was on point in order to get the most out of each program I did. Each of the programs I did had a nutrition plan that made it easy to follow. I am very fortunate that my training partner, and Coach, is my wife Tara. Sundays have become a joint effort in food prep. We keep each other accountable for not just our workouts but nutrition as well. I would never had made it without my wife’s support, she is my motivation. I’ve completed Hammer and Chisel, 21 Day Fix EXTREME, and now Body Beast. What I’ve liked is the ability to do all the workouts in under an hour and the nutritional guides, both of these reasons have made it easier to complete the programs. I feel like a new man. Losing 103 pounds and 9.5 inchess off my waist has given me a new lease on life. I am no longer worried about being pre-diabetic, and I am off blood pressure medicine,1 and I have more energy and confidence. I make the time in the morning, 4:30 AM during the week, to work out. If anyone has seen my workout vids I post, I use a combination of cuff weights and light dumbbells on left arm to lift. I have built more muscle than I ever have had, my confidence, energy, determination, and motivation have grown by leaps and bounds. I actually did a minute straight of burpees! I feel healthier each day but the achievement that I am proud of is not the ones I just mentioned, but others telling me how much my dedication, drive, and results has inspired them. If you would have told me that just by doing this program and sharing my journey, I would inspire people, I would say no way. This has given me the greatest pleasure and pushes me harder toward my next goals. Since starting my Beachbody journey, not only have I gotten physically stronger, but mentally and emotionally stronger too. I now feel I can achieve anything. In fact, I have a goal to participate in the 2017 Beachbody Classic and two obstacle course races (Tough Mudder and Warrior Dash). I know it’ll take hard work, dedication and pinpoint nutrition. It’ll be hard but not impossible, and I know I can do it. All the people were on their own journeys, some experienced Coaches, some newbies. Seeing everyone post their ups and downs each day helped inspire and motivate me. Even on my bad days they pushed me to continue. My Coach, my wife Tara, was amazing. She guided me how to follow the program. Whether it was working together on meal prep or together working out, she pushed me daily to fulfill and exceed my goals. I could never have done what I have done, or continue to do, without her love and support. 1Consult your physician before discontinuing or altering any prescribed medication.